how to add licensed editor users to open editor spots? I like the tool but the model editor is slow and ungainly. It is really slowing down my work, so I am about to evaluate other tools. 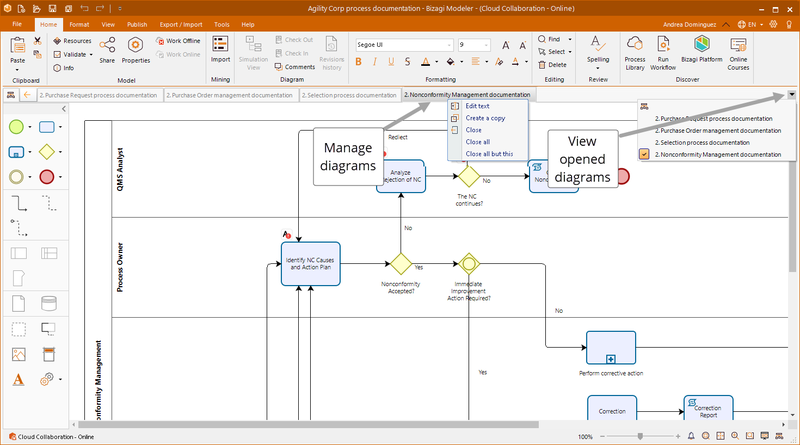 If you have many opened diagrams, close them and only work with the current diagram or maximum 10 diagrams: When there are more than 10 diagrams opened the performance of the Modeler might get affected. The work with Bizagi Modeler is totaly horrible and it's really really slowing down. I upgraded to version 3.1.0.011 64bit and due the customer I have to use it. But I really persuade him to leave this tool. We would like to know what characteristics have your computer: Free space, Windows version, RAM memory, drives, and so on. I suppose that it's much more then enough for this type of program. And I'm really sorry but for this kind of problem I'll change the tool for online Flowchart Maker & Online Diagram Software (https://www.draw.io/) for me it's enough an is fast, very fast. Thank you very much for your feedback. We would like to know if it possible to carry out a remote session to evaluate Modeler´s performance. A member of our support team will contact you by email in order to schedule it. No sorry. No remote support. I'll definitely uninstall your software today. I only draw last small diagram. And if the situation (problem with RAM and resources) will be the same as I mentioned above I'll make a screenshot of consumed resources and put it here. But as I said I'll choose to leave your modeller. I only send the response to this forum and agree with Kevin that the problem persist. I don't want to solve it .... even through Remote Session. For this you need to have a huge tester department. I will change the software and give advice my current customer to leave the Bizagi. Hi, I absolutly agree. You guys have a serious performance issue here. Web-Modelling tools perform better. Even with a simple process (two events and two tasks) simple operations like moving tasks around, connecting to new tasks and auto-aligning tasks are very laggy, take multiple seconds and often lead to the program window being in "not responding" state. Opening properties editor means a wait of several seconds just for the mouse menu to pop up. The performance is abysmal even if compared to web based solutions and it has been getting worse with every update. I am forced to use your program by our environment but every time I start it up and try to edit a process I hate it more and more since it just is not production capable. Exporting processes is also a pain since you use different directory selector for each different export, needlessly show image exports after every time you do it and put xpdl-export into its own subdirectory without asking. I could live with all these little inconveniences IF the editor worked but as it is they just make it even more of a pain to try to do my work. I've run the program on multiple high end development computers, at the moment on a Dell XPS laptop, so it is definitely not an issue of not meeting the requirements. To improve the performance of the Modeler keep less than 10 diagrams (tabs) opened in a Model. The diagrams opened are displayed at the top, and can be accessed through the small arrows on the right. To close opened diagrams, right-click any of them and select Close, or Close All. This will not erase them from the file, this will only close them. Do you people read at all what we write here? I specifically stated that the performance problems manifest with simple processes, four components in all, and you tell me to close diagrams. Where did I say that I have any other diagrams open? Your responses are worse than the performance of your program. We have sent this message because it is a common performance issue that we have detected. You are right that it is not your case. That´s why that we would like to carry out a remote session with in order to analyse your computer and enable some traces to get further information about it. A member of our support team will contact you to organise the session. Do you have any idea to solve them? One thing that helps, at least somewhat, is to switch off Smart Align. Although you have a fast machine with excellent technical characteristics, you may experience these performance and visualization problems because you are using a 4K monitor or maybe the resolution of your screen is not appropriate for Bizagi Modeler. Please verify your screen resolution and change until you find the one which accomplishes the expected behavior. Thanks for your understanding.